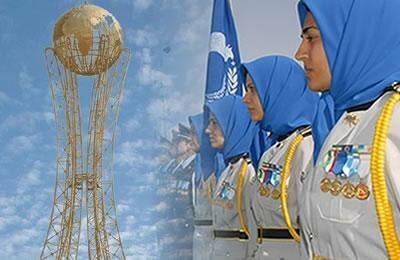 Camp Ashraf has been the home to 3,400 members of the People’s Mojahedin Organization of Iran (PMOI), main democratic opposition, since 1986. Ashraf is an urban complex built by its residents and their financial resources. It is comprised of a university, mosque, sports stadium and facilities, concert hall and parks. The residents of Ashraf are ‘Protected Persons’ under the Fourth Geneva Convention. In an agreement signed between the U.S. Government and every resident of Ashraf, the United States undertook protection of Ashraf residents until their final disposition in exchange for voluntary hand over of their arms. Despite this agreement, the United States transferred the responsibility for protection of the residents to Iraqi forces in January 2009. This transfer was strongly protested by a large number of parliamentarians and defenders of human rights across the world and they warned against its consequences. In February 2009, the Iranian regime’s TV reported about Ali Khamenei’s demand from Iraq’s Prime Minister Nouri al-Maliki in a meeting in Tehran, telling him to “implement the bilateral agreement on expulsion” of Ashraf residents. Despite the Iraqi government’s written commitment to guarantee the rights of Ashraf residents, since January 2009, the Camp has been under an inhumane siege. In July 2009, the Iraqi forces attacked the unarmed and defenseless residents of Ashraf that led to 11 deaths and over 500 wounded, including women. Some of the wounded suffered serious injuries and handicapped. On January 7, 2011, agents of the Iranian regime backed by Iraqi forces attacked Ashraf residents leaving 176 wounded, 91 of them were women. The wounded were refused hospital treatment. On April 8, 2011, Iraqi forces attacked and killed 36 residents and injuring over 300 others. Among the crimes committed in this bloodbath, was the barbaric assault against women residents and their compounds, killing 8 women and wounding and battering tens of others. 100 residents in Camp Ashraf to look after the property. According to an agreement with the UN, also endorsed by the US, the residents would remain there until all properties are settled. There is a central police station and at least five other police posts and uninterrupted patrols in the small camp. Surveillance cameras have been installed in various areas of the camp to control all commuting inside. The signals from these eavesdropping devices and spying cameras are transmitted to the Iranian regime, leading to serious security threats to the residents and their families in Iran. Heavy medical restrictions are imposed on the camp residents, and this has led to the death of residents by the start of 2013. The ground is gravel, and there are no pavements. The GoI does not permit contractors into the camp to build stable ramp entries for the disabled. The UN Working Group on Arbitrary Detention on 23 November 2012 described conditions at Camp Liberty as synonymous with that of a detention center and in violation of the Universal Declaration of Human Rights and the International Covenant on Civil and Political Rights. Mr. Tahar Boumedra, SRSG’s advisor on Ashraf affairs, who was responsible for Ashraf at the UNAMI for three and a half years resigned in May 2012 in protest to Martin Kobler’s attempts to cover up violations of human rights at Camp Liberty. Instead of designating Camp Liberty as a refugee camp, the camp has been illegally designated a “temporary transit location – TTL” to cover up the appalling lack of minimum standards for a refugee camp and violation of laws and regulations related to refugees and asylum seekers. The term TTL applies to a camp which has a several-day or several-week passage for transferring refugees to third countries. Many distinguished international jurists, Parliamentarians, former government officials, human rights advocates, and human rights organizations have urged the UN to urgently recognize Camp Liberty as an official Refugee Camp and accept responsibility for the residents’ protection and to ensure that their rights are respected under international law. On February 9, 2013, the Iranian regime and its agents in Iraq launched 40 rockets at 5:45am, killing 7 including a women and injuring 100 others. Residents of Camp Liberty urge to be sent back to Ashraf until their relocation to a third country is clarified. September 1, 2013, criminal forces of Iraqi PM Nouri al-Maliki at the behest of the Iranian regime attacked 100 defenseless unarmed residents of Camp Ashraf who had remained in the camp to care for property until a final solution was to be found. 52 people were killed, 6 were women. 7 residents were taken hostage, 6 were women. The massacre has prompted worldwide condemnations and calls for an independent investigation into the fifth massacre carried out against Iranians refugees. A U.N. delegation visited the camp in Diyala province a day after the killings and spoke to 42 survivors. The United Nations said at least 52 residents had been executed during the latest massacre at Camp Ashraf. Residents in Camp Liberty and Iranians around the world staged a hunger strike for 108 days demanding the immediate release of the seven hostages and urged for UN Blue Helmets to be stationed in Camp Liberty. Amnesty International condemned the killing of the 52 residents and called for an independent and impartial investigation into the killings. The 42 survirors were transferred to Camp Liberty. December 26, 2013, Camp Liberty was targeted by dozens of missiles of different types. 4 residents were killed and over 70 people were injured. This is the fourth missile attack on Iranian dissidents in Camp Liberty in 2013, while the Iraqi government has not yet delivered the bodies of those massacred during the September 1, 2013 attack on Camp Ashraf, to Liberty residents for burial and seven hostages are still in Maliki’s secret prisons.